Let's get posBoss and Smartpay talking! With Smartpay, depending on your terminal, you can be set up with Smartlink or SmartConnect. If you are using Smartlink - this article is not the one. Head on over here. Once you receive the terminal, follow the SmartConnect guide to get set up and locate your 8 Digit Pairing Code. In the posBoss till app go to: Settings > Press Sync Menu. After syncing is finished, fully close and restart the posBoss till app (press the iPad’s home button twice, and swipe up on posBoss to close). 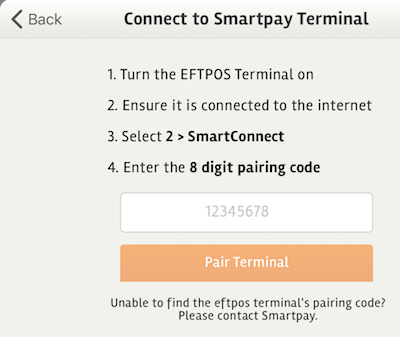 Can't see the SmartConnect logo in posBoss eftpos settings? If you were previously on Smartpay Smartlink you will need to press the settings button at the top right of the window, then press disconnect.